The model aircraft arrived at Sivry-Rance in 1964, It is indeed in 1964 that we begin the adventure via control line models. Thanks to my piggy bank, I buy a Spitfire Cox 0.8 cc, then we build (with the help of my father Yvon) models up to 1 m wingspan and 6.5 cc always in control line. 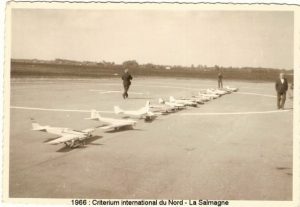 In 1966, a friend told me that in La Salmagne, a club exists where they are flying model airplanes by radio. 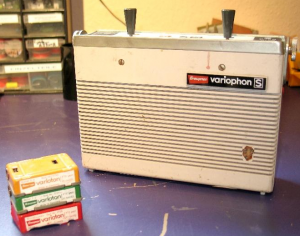 This is how we discover the radio control, my father Yvon Wérion immediately understands what this activity can teach us and decides to start in this hobby he buys a radio Grundig Variophon S in second hand. In the beginning, we must speak about free flight, since it was not uncommon to see our model disappear on radio failure or lack of piloting experience. After 1 or 2 years of unsuccessful attempts, we join the club of La Salmagne, after a few months of learning, we are able to take off and land. La Salmagne (UASH in 1967) was a club turned towards the F3A, this club counted several members participating and organizing competitions, like Jean Fontaine (Scientific France) , Denis Chabert and Michel Louis whose son Pierre is 4th in F3A WC 1963 to Genk. Naturally, we also start the F3A competition. Freddy Dupuis, one of the founding members of AASH also joins Salmagne, but has difficulties to cross the Franco-Belgian border, in 1970 it was necessary to pay for a temporary importation of the models. He then proposes to the “Belgians” flying at the UASH to create a club in Belgium in the region, this is how our club was born on the 16/05/1973, the first “A” from AASH replacing the “U” from UASH ! The club had 12 members in 1973. The AASH will naturally turn to the organization of F3A competitions, but also shows, open days and even participate in commemoration WW2 (Lancaster). The AASH will even be the basis for the first F3A ECs in Koksijde 1976. It is the work of many, present here or elsewhere …, which allowed to be what we are today, able to welcome you for this 19th European Championship F3A.